What do you get when you throw cards at a roguelike? Slay the Spire [Steam, Official Site] answers that question and then some! Do note, that it's currently in Early Access so it's still getting new content updates and bug fixes. Here's some initial thoughts after spending some time with it. Disclosure: Key provided to us through our Steam Curator. A lot of deck-building card games are online, free to play and end up costing you extra money somehow. Not only that, but you need to actually find one on Linux that has a decent player-base. I'm not saying they're all bad, Faeria is quite good, but like a lot you do need to grind or pay. I think this part of why I love Slay the Spire, as it's pay once, single-player goodness with procedurally generated levels to keep you coming back for more. Outside of the battle system, you pick the path you wish to take. Something I have to remind myself not to keep calling an "FTL-style" system like everyone (including me) seems to do now, because games used this before FTL, but they kinda made it cool again and I'm sure since then many more games use it. Pretty standard stuff now, you pick a path and deal with anything that comes up. You will come across random discoveries and events, like this one. Yes—it was a trap, with a large boulder now heading my way of course. However, here's why I like it even more as it gave me multiple options on how I wished to deal with the trap. Each obviously resulted in some kind of nuisance, but what nuisance was I willing or able to put up with? It's not all random events and battling, as you will also get a chance to pick a campfire if the RNG is being kind. This will give you two choices, to either heal your character or upgrade a card. Often a difficult choice, but it's all these interesting choices that make it such a worthy game to play. Some of the random events also make me laugh quite a lot. This mischevious looking snake-like thing gave me a rather tempting offer, I wasn't short on Gold, but even so, 175 Gold for the price of one curse card? Sssssure—why not, what could happen? Once accepted, the screen was literally raining down Gold and I was happy. So I thanked the weird Snake and continued my quest. Dealing less damage when a bigger enemy turns up is exactly what I don't need. You can bet that's where my first journey stopped. There's so much to talk about with this game and why I enjoy it so much, that it's quite hard not to review the entire thing, but that wouldn't be entirely fair since it's not finished. Right now it has over 200 cards to grab, over 50 unique combat encounters, over 100 items to find and loads of other things thrown in for good measure. It's certainly not short on content and it's only going to get more over time. Note: If you have more than one monitor, do not use the borderless fullscreen mode. It will stretch it across your screens and completely cut off a bunch of it. If you do manage to mess it up, find the "info.displayconfig" file in the installed directory and remove it to reset it back to windowed mode. The normal fullscreen mode seems to work fine, apart from it grabbing the mouse on alt+tab, but you can simply bring up the Steam Overlay to get around that. That's not a Linux-only issue, I've seen Windows gamers also report it. 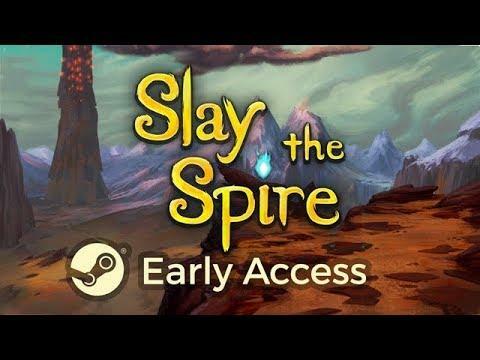 You can find Slay the Spire on Steam, even though it's not finished I think it's fantastic and I think you will like it too. It's often funny, it takes you by surprise and the art is fantastic. Very tempted. Holding out for a sale. So Hand of Fate with turn-by-turn deckbuilder combat instead of 3D action scenes? I'm game. Does it have any kind of story and goal to it or is it just strings of random encounters until you die or complete an arbitrary number of encounters? Never played FTL. Already played it for 3,5 hours. I guess it's pretty replayable as as soon as you die you need to start all over again. You loose your deck and need to start in Act 1. Every round is different though as the map get generated on each start and you even encounter different bosses. The only thing I'm missing is not being able to battle others yet. This game is incredible. I can't recommend it enough. You'll easily sink 50 hours into it without thinking twice. Did anyone manage to make this game run in Fullscreen on Ubuntu 16.04? For me, the game just pretends to be fullscreen, but renders under the launch bar and top bar - both in borderless and normal fullscreen. Have you created a bug report? Not sure if I encountered that issue. In the meantime I'd switch to windowed, which works fine for a card game. Erzfeind Have you created a bug report? Not sure if I encountered that issue. In the meantime I'd switch to windowed, which works fine for a card game. I did. And then refunded. And then added it back to my wishlist. I'll just wait for the game to really be released, many people (on all platforms) seem to be having problems with the windowing. They probably thought they could be clever, doing the windowing themselves instead of going with standard libraries for that like SDL. And I never play games windowed. Completely takes me out of the game experience.